When it comes to the kitchen, I would not call myself a minimalist. At least, not by “minimalist” standards (whatever they are anyway). That said, I do not consider anything I own to be unnecessary – I do not own special Christmas crockery, or fancy obscure gadgets (cherry stoner, avocado slicer, chocolate fountain), for example. I own a lot of kitchen things because I like to cook, and I especially like to eat. Whilst I think it’s possible to live zero waste without needing to cook everything from scratch, I personally enjoy making food from scratch. Cooking is my creative outlet. Making food from scratch requires a bit more stuff. 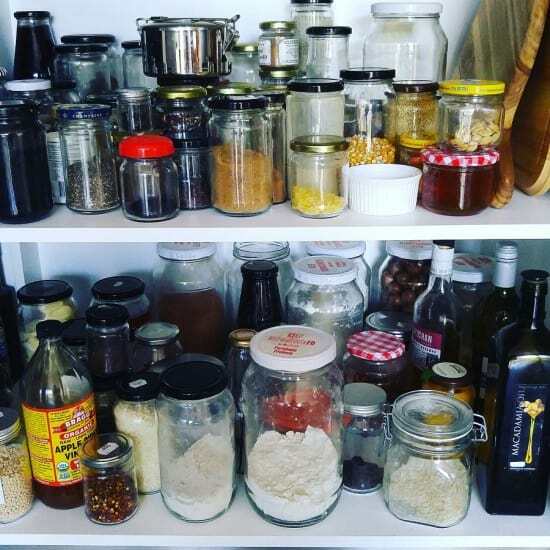 I thought I’d show you round our kitchen, and talk about our zero waste kitchen essentials. Essentials, of course, are a personal thing, depending on what you like to eat, living arrangements, how you cook and where you live. I don’t think everyone living a zero waste lifestyle would need to own everything that I do. This isn’t an instruction manual, it’s a snapshot of the choices that we’ve made in living zero waste (with a hint of minimalism thrown in). When I shared this photo on a previous tour of my house, someone asked me if I’d tidied up. OF COURSE I TIDIED UP! My house is not ever as tidy as this unless I make a concerted effort. For example, the draining board is almost always full of drying dishes (one of the downsides of zero waste living is the extra washing up). And there’s often ferments, or sourdough, or harvested veggies sitting on the side. My zero waste, minimalist (ish) kitchen. Let me introduce the kitchen. 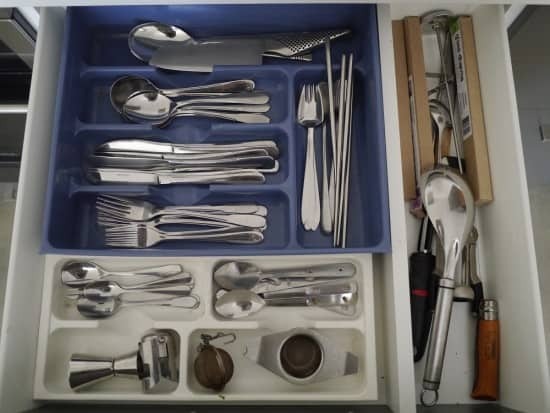 It’s an L-shape with an impractical amount of cutlery drawers (there are 7!) and very little cupboard space. I am determined not to add cupboards to the wall, as I like the white space. I’d rather put up pictures! Kitchen Counters: On our kitchen counters we have 2 large Klean Kanteen growlers. When we run the hot water, it actually takes 7 litres of water to run hot, and we can’t just throw this down the drain. I used to use old wine bottles but we’d end up with 11 or so on the counter, and I couldn’t bear the clutter! These growlers can be used for beer, and we can take them camping. The white machine in the corner is our food processor (it’s called a Thermomix). It’s got a stainless steel bowl, and also has the function to heat. I use it every day – to blend, chop and mix, mostly. Before this, I had a Magimix, but the bowl was plastic. Next to the hotplate is a glass jug that doubles as a utensil holder. We have 3 silicon spatulas, a couple of wooden spoons (one for sweet things and one for savoury) and a rolling pin. The kettle is a stovetop one that we bought second-hand. I like that it lives on the hotplate, rather than cluttering up the counters. 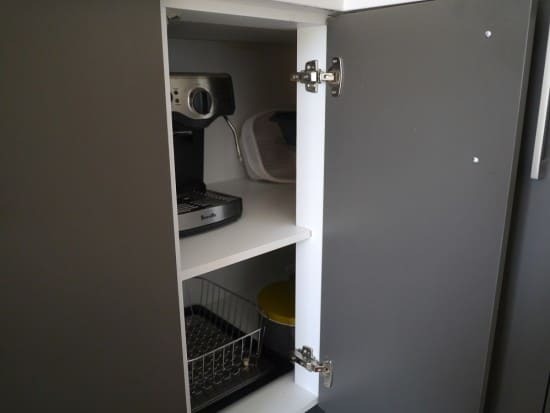 Tall Cupboard: The cupboard on the right was intended to be a pantry, but unless you’re 6 ft tall it’s not very practical and there would be a huge amount of wasted space. Top shelf: we have a stick blender with various attachments (I sold the ones I didn’t need on eBay!) and a spiraliser. Possibly the only gadget I have that’s a bit gimmicky, but we use it a lot in summer. In fact, my husbands uses it, so it’s staying! Middle Shelf: we have wine and champagne glasses (currently 5 wine and 2 champagne), water glasses (5 assorted), two short coffee cups (that were originally yoghurt pots), salt and pepper grinders and my onyx ice cube tray. At the back are some glass jars I was storing for a workshop, and my husband’s cycling water bottle. Bottom shelf: this is the coffee/tea shelf – you just can’t be minimal about that! We own 8 mugs (which seems excessive but my husband originally had 16! ), our coffee press, two KeepCups, bits and pieces for the coffee machine (handle thingy, jug, funnel) and of course, tea and coffee. Drawer 1: I guess the top drawer in our kitchen would be classed as our junk drawer. We keep Hans’ (our adopted greyhound) lead and muzzle in here, sunglasses, garage clicker, pens and seeds. As we had so many drawers that weren’t that useful for much else it made sense to keep this stuff here. 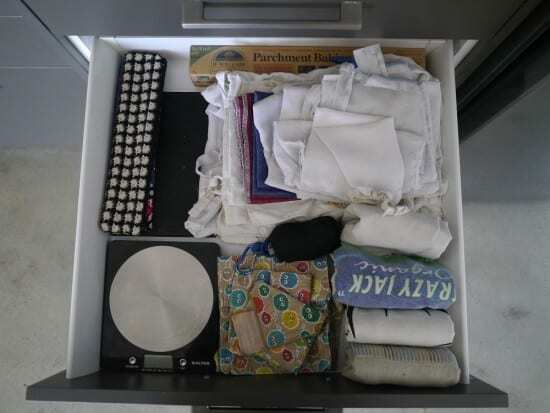 Drawer 2: The second drawer down contains our kitchen scales (so necessary! ), our reusable shopping bags, produce bags and reusable wraps. There’s also a black book where I keep my most-used recipes. And yes, I use baking paper (which I reuse, and then compost). You can read why here. Drawer 3: The third drawer contains most of my reusables. I have 3 baking sheets (one is in the fridge) and 2 cooling racks. I find it useful to have 3 trays when I’m baking as otherwise it takes twice as long and uses more electricity. The pink and red circles are silicone bowl covers (there’s a white one too that might have been in the fridge). 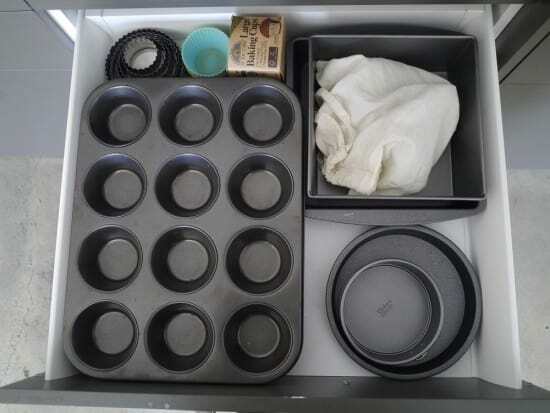 Drawer 5: The rest of my bakeware. Yes, it is necessary to have all of these different sizes! I have 2 square tins, a muffin tin, individual silicone cupcake cases, two sandwich tins and a tiny cake tin for experiments! I tried to choose something to get rid of when we moved, and I just couldn’t. You know what? I’ve used every single thing since we moved. I guess they are just all essentials! Drawer 6: Okay, so maybe there’s slightly MORE bakeware in here. And I haven’t used that flan tin in the last 6 months, Still useful, I say! 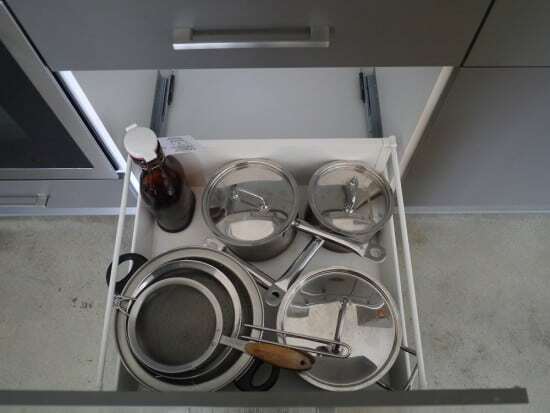 You’ll notice that despite the front of the drawers being enormous, the sides and back are the same depth as a regular drawer, making them very hard to fill. Hence why the bakeware is spread across three drawers – it is in no way because I have too much! I have a big maslin pan which I use for preserving and also for cooking up big batches of chickpeas. My frying pan sits on top, and in between is my glass loaf tin – sourdough rusts the metal ones. Underneath the round cake tin is a banneton basket (for proving sourdough) and three large bowls (one ceramic, two glass). The pestle and mortar is a charity shop find. 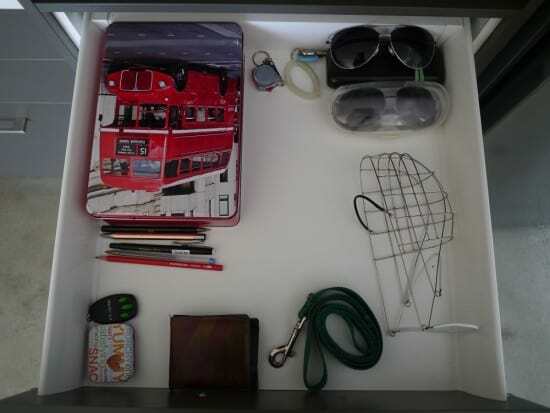 Drawer 7: Much as I hate plastic, I dislike a jumbled cutlery drawer more. And there seemed no point discarding what we already had to buy something new and plastic-free. We have two sharp knifes, and a cutlery set for four (it was originally for 8 but we decluttered the other half). There’s two sets of camping cutlery also. We also have a set of salad servers and a big serving spoon, two tea strainers, a spirit measure, champagne stopper, metal chopsticks, a vegetable peeler, thermometer and corkscrew. Plus there’s some reusable straws (in the boxes). Of everything, a good sharp knife (ours is the Global brand) is definitely an essential. We also have a set of measuring spoons (not pictured). Drawer 8: our crockery. We have 6 dinner and side plates, and 5 bowls as one broke (which is fortunate as the drawers are too shallow to hold six bowls). There’s my set of measuring cups, a Pyrex measuring jug and assorted bowls and dishes that get used for various things. The two brown ones were the containers for some fancy dips purchased at the supermarket! Drawer 9: We have 3 saucepans, and I wouldn’t like any less. I tend to use them for storing leftovers in the fridge also. I have two sieves and two colanders. I use them all, but I am sure once they break I will manage with less. The glass bottle is a beer growler for our local zero waste beer store. Drawer 10: The drawer under the oven is even shallower than the other 6, and barely anything fits. 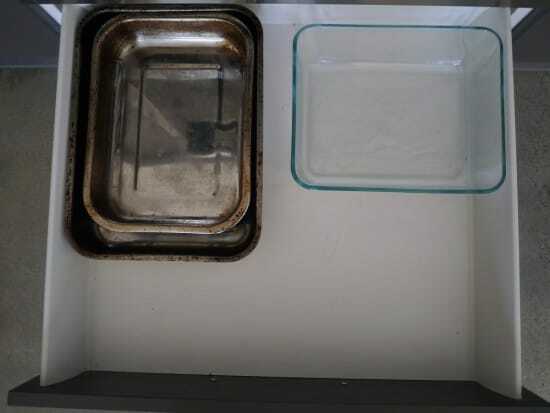 We keep our two stainless steel roasting dishes in here and our rectangular Pyrex containers (we have 2, but one is currently in the freezer). Cupboard under the sink: We keep our extensive jar collection here. Glass jars are useful for everything, and are definitely a zero waste essential! 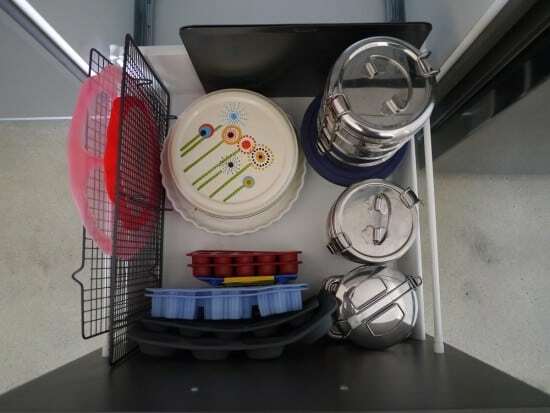 Corner Cupboard: We keep our coffee machine here, and the dish drying rack. There is also a plastic colander that came with the house (randomly) and more storage tins. Other cupboard: As well as storing our food, we keep our chopping boards here. Now I’d love to hear from you! 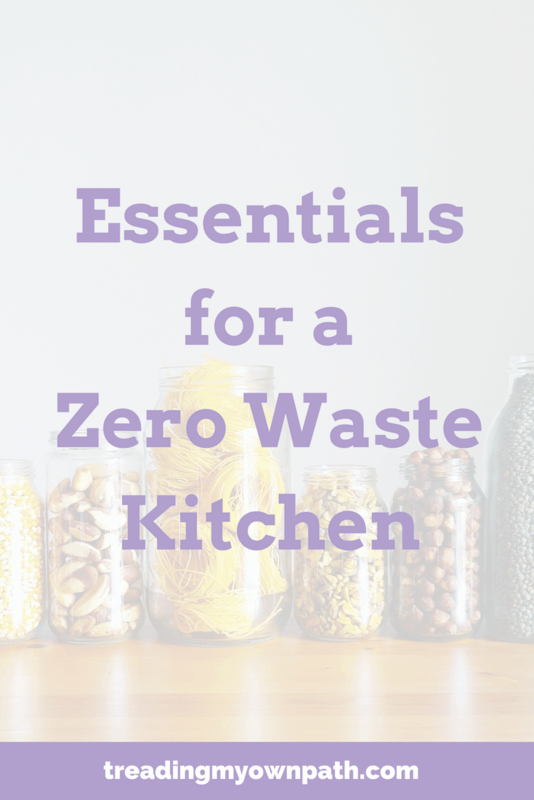 Tell me, what are your zero waste kitchen essentials? Do you love cooking, or hate it? How does your kitchen compare with mine? What could you not do without? What can you do perfectly well without? Have you ever thought you’d not be able to manage without something, only to find that you could? Is there anything that I have that jumps out at you as surprising? Are you a gadget fan, and if so, what are your favourite gadgets? Are you much more minimalist than this? Anything else you’d like to add? Please tell me your thoughts in the comments below! 29 Comments • Leave a comment! Thanks for the tour! You have a lovely kitchen. Thanks for taking the time out to have a look, Rebekah! It’s a lovely kitchen- we have those same pottery dip containers! I think it’s quite minimalist. I love to cook, but I’m not as much a baker (I think mainly because I am a dietitian I always tend to go too far on the modifications to making something healthier and end up with a dry brick!) Hence, I have less bakeware, but a lot more knives and chopping boards (five of each!) and somehow I have 20 tea towels. I do have a tendency to sneak a lot of vegetables into my baking! I made an awesome brownie recipe with sweet potatoes and avocado a few years back… in fact, I should probably share that sometime! I can never understand how we always have at least 3 tea towels on the go at the same time! Drives me crazy! You have a wonderful kitchen! Thanks for the tips. Thank you for the kitchen tour! 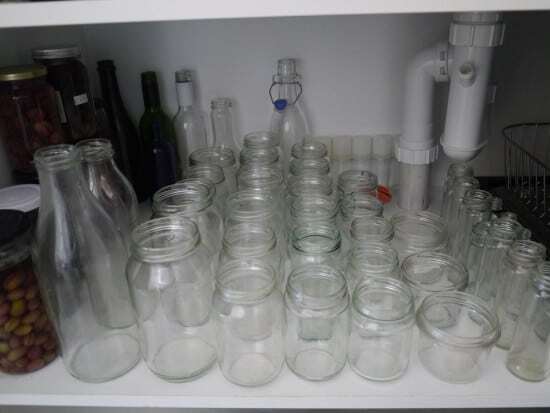 It’s impressive how all the glass jars are arranged so neatly inside the cupboard under the sink. I always have a hard time scrubbing off the labels from the glass jars so sometimes I reuse them with the old labels on. Certainly not as pleasant as how your glass jars look like! My pleasure Po! They didn’t used to be, but I discovered that if they are roughly ordered by size it makes finding the one I want soooo much easier! And it’s actually no more trouble. They are all in rows so I just add the ones of the same size to the corresponding row when I put away. If the labels don’t come off with a soak and a bit of a scrub, I use eucalyptus oil. that stuff is magical! It is also great to remove the sticky glue that gets left behind. I find it easier to see what’s in the jar (clearly!) and also less confusing as my brain thinks the thing in the jar is what is on the label! It’s especially confusing when the jar is something that would normally be in the fridge! You only have a small amount of crockery and cutlery. What do you use if you have guests? Great question Diane :) Our cutlery set is for 4, but we have entree cutlery and main cutlery, plus dessert spoons and soup spoons, and then in the smaller sizes fruit spoons and teaspoons, so it is actually fine for 8. We have 6 dinner plates and 5 bowls, plus a purple bowl that makes it up to 6. So we are pretty good for up to 8. (The bowls are quite big and we often use them for dinner). My husband’s parents and sister’s family plus us is 8, so that works perfectly. 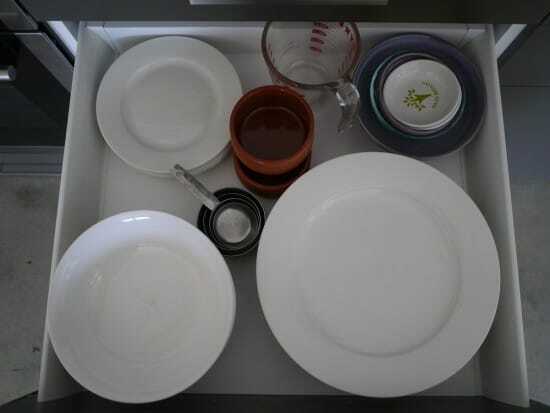 Sometimes we have to wash the side plates or bowls up to use again for dessert, but it takes two minutes, and I like that it reduces the washing up at the end of the meal! 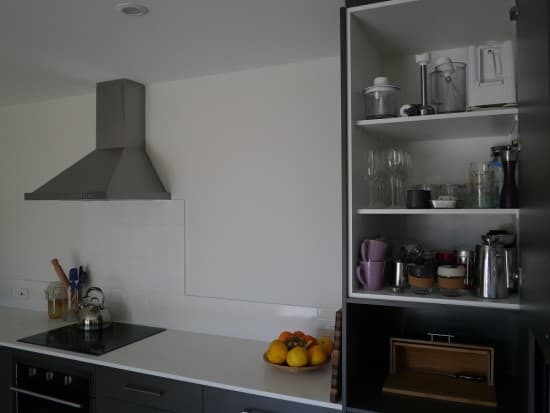 I love your kitchen!, and those drawers! I am slowly making progress, but I am a long way from minimalist. Thank you so much for sharing. I love your water growlers, that’s a good way of saving all the water that would usually just go down the drain!!! I sometimes just fill up a pot over the day, which I then use in the evening for pasta etc. The two other knives do everything else. They are technically vegetable knives, a really good size though and we try to keep them sharp. I think one good knife is worth a hundred blunt rubbish knives. I loved this post, thank you! Thanks for sharing this Gina! I definitely think that small kitchens make us think about the essentials. My parents have a similar kitchen to yours it seems. I cannot understand why they need several of everything! 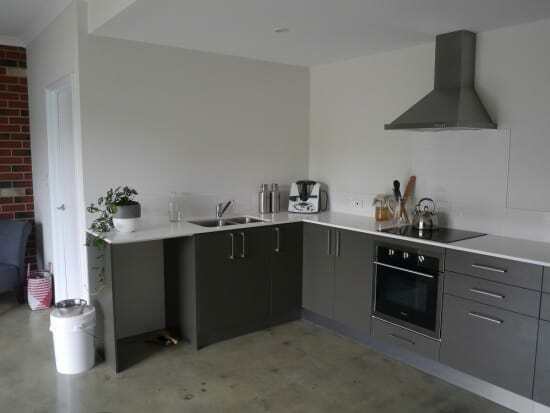 When we moved to Australia our first two flats both had very small kitchen spaces and it was a real test for me. 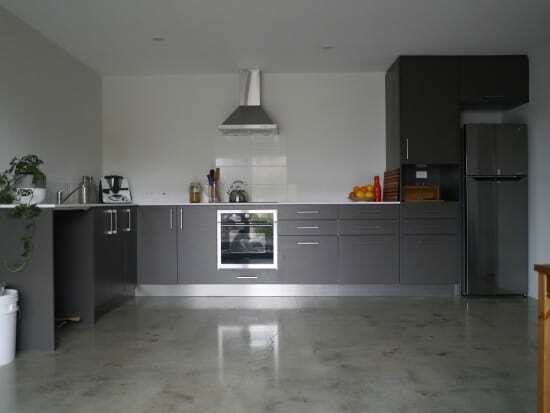 I always thought a big kitchen was better, but now I realise that it’s a well thought-out kitchen that’s better! We actually have a stovetop kettle. 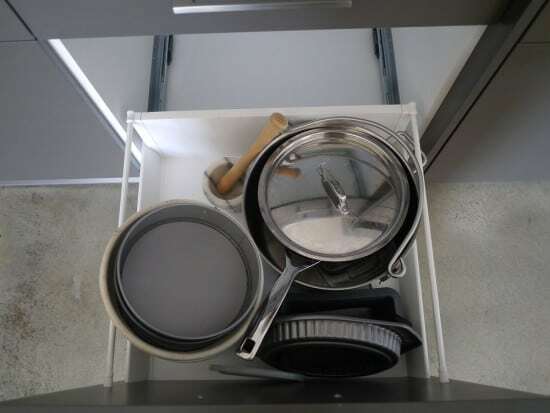 I like that it can be stored on the stovetop rather than the counter, so leaves more counter space free. Maybe your boyfriend is open to that? We picked ours up second-hand. Of course there’s no electrical components to go wrong, and ours in entirely stainless steel except a few bits of rubber, so will be super easy to recycle when the time comes. Alternatively, what about one of those tea infusers that you pop straight into the cup? There are even travel ones that are cylindrical and have a case so your bag won’t get wet afterwards. You can see I’m taking your tea-drinking dilemma very seriously! Where do you keep the caps to all your jars? Hi Ollie, they are in a tub on the stop shelf of my under-sink cupboard (which didn’t fit in the photo). Went to soak up excess oil from roasted vegetables last night, but didn’t have any paper towels. 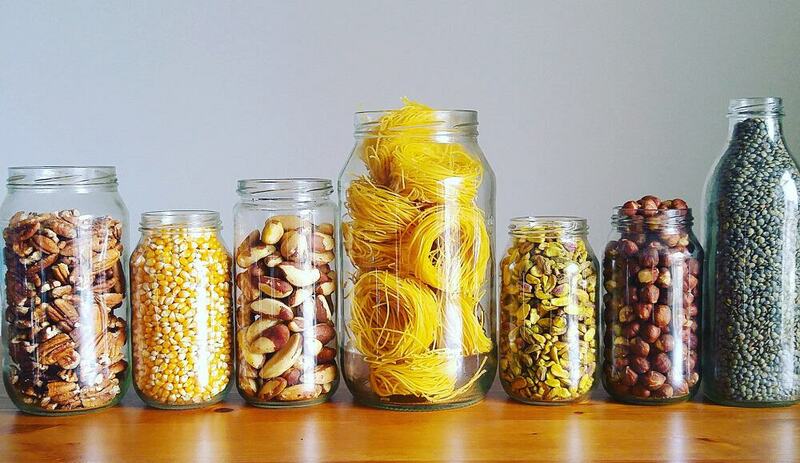 What else would work in a zero waste kitchen? Hi Angie, great question! 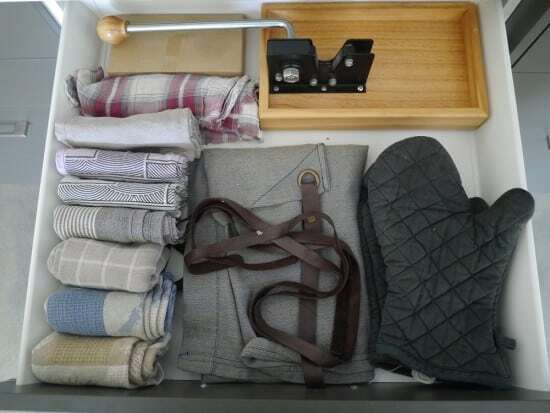 I would suggest a few things: using old kitchen towel or cloth (you can wash and use again), using a rack and allowing to drain, or using tongs and giving a good shake. Obviously if you can use a little less oil it helps with this issue. Hope that helps! Hi Lindsay, I signed up for the newsletter a while back but don’t seem to have received “Enough is Enough” yet. Would love to have it. Also love your kitchen tour — working on it — and your banner photo is simply spectacular! Thanks for all the inspiration. Hi Peg, I just sent you an email :) Thanks for taking the time to look and comment! Good work, Ashleigh! Stuff that we own and never use is a real waste of resources – it took me a long while to realise that. But being able to pass it on to people who will use it is so much better, and hopefully stops them going out and buying new stuff too – a double win. One you realise that other people want and will use your old stuff, it definitely makes it easier. Good luck with both Plastic Free July and the decluttering! HI Lindsay, I had a quick question. I am an Environmental Studies major and so I know that plastic is the evil of all evils, but what do you suggest when the place you are living does not recycle glass? I know recycling glass is very costly and has a large carbon footprint and it does seem more common for places to recycle plastic. I am aiming to transfer to a plastic free life and minimalist life but am just curious which is better when you do end up having some waste? Plastic which is environmentally worse but can be easily recycled, or glass which is better for the environment but not commonly recycled? Thanks for your time! Hi Karissa! Glass is not recycled where I live, so I try to avoid purchasing it. I try to buy things without packaging, so refills from the bulk store which avoids the need for glass or plastic. If I need to choose I try to choose a glass container that I can reuse or repurpose. If things are available in metal (aluminium or steel) that is more recyclable, so could be an option for you? Your blog is amazing! I love the idea of zero waste and I’m gradually making changes. Your posts are so informative and clear that I just can’t stop reading them :) Recently, I’ve written two posts on my handmade reusable shopping bags and cotton pads, but I can see I still have a lot of work to do. I’ll be definitely reading all of your tips because I really like your style of writing!